Ten Tips for better Stretching! 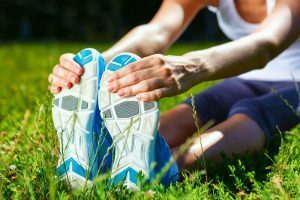 The debate over stretching has been around for a long time, but recently science has proven a few things to help clear the confusion. We’ve done the study and brought you a top ten list for stretching! Dynamic BEFORE exercise. Static AFTER exercise. Static stretches have been proven to reduce power output of muscle and have a sedative effect on the body. Dynamic stretching should aim to gently increase joint ranges. It is not ballistic stretching! So don’t go trying to kick yourself in the head! Static stretching should be comfortable, this is not a cases of no pain no gain. Statics should be held for MINIMUM 20 seconds (clock seconds not head seconds) any less and there is no benefit received. 45 seconds should be the maximum, any longer and you risk micro trauma. On non-training days, try PNF stretching (Proprioceptive Neuromuscular Facilitation). This involves statically stretching a muscle and gently contracting the stretched muscle. Hold this for 7 seconds, breathe, and relax into a deeper stretch. PNF is great for increases in joint range. Never ‘bounce’ your stretches. The body has a protective mechanism that will not respond well to fast, jerky and bouncy stretching. Breathing influences stretching. Deep breathing stimulates the parasympathetic nervous system; this is responsible for your body’s rest and digests mechanism (or carb coma!). This will help the body relax and reduce muscle tension. Stretching is different for everybody. Often text book stretching doesn’t quite hit the spot we are looking for. The great thing about stretching is it’s flexible (pun intended). If you feel a stretch in a strange or odd position, then keep stretching that way. Stretching should come in 3D. We have more than 600 muscles in the body and they all run at different angles. Sometimes placement is all that is needed to take a stretch to the next level. For instance, Pec major has 3 different fibre groups and requires a different angle of your arm to stretch each. Everyone knows how to stretch hamstrings, but did you know there are THREE hamstrings and that by internally or externally rotating your foot during hamstring stretch will target the different muscles! Stretching can become very technical when dealing with injury or chronic pain. For example: stretching a muscle which is providing stability because there is a dysfunction elsewhere, can makes things worse and result in the muscle becoming tighter and more painful. If you have an injury it’s best to see a professional. If you have any questions please post them in the comments, or better yet, come and see us and we can talk you through how to best stretch suitable to your needs!